I will begin my sharing with you a very auspicious heart inspiring appearance. Today is HG Gurudas Prabhu’s 72nd birthday. Let us wish all blessings upon him by loudly chanting Hari Bol! 41 yrs. 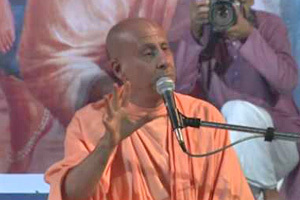 ago he dragged me on the stage with Srila Prabhupada. Today I dragged you on the stage. We were discussing the childhood pastimes of Lord Chaitanya, how he would awaken the love for Krishna who he was himself, both in the hearts of the devotees, and those who were most fortunate without even knowing that he was Krishna! For those who had not previously been devotees of Krishna, by developing love for him they naturally and spontaneously developed love for Krishna. And for those who are Krishna’s eternal associates, he deepened the intimacy of their love for Krishna, according to the higher rasa of not having the condition of your love that he is the all-powerful liberator, savior, the Absolute God of all Gods. They simply loved him because he was Nimai. And as was explained, when the Lord would perform apparently naughty activities, as did Krishna in Gokul, it was for this explicit purpose of giving the highest treasure of this eternally sweet experience of loving exchange with the supreme Lord, beyond even liberation. So, Nimai was very naughty. And his father began to teach him how to read and write. Small boy! “I’m the compiler of all the Vedas. I’m the knower of the Vedas. And all the Vedas are to know me.” But that same truth is learning how to write, this is how to make the first syllable of the alphabet, the first letter. And Nimai was so enthusiastic, immediately, he would draw it. And people were spell-bound by the sweet accent in which he would speak the letters of the alphabet. And he would speak them all with the names of Krishna, but still very restless. But, there was one person he was very respectful toward and that was his elder brother Vishwarup; he was about 10 years older to him. Vishvarup was a great scholar, very beautiful, kind, gentle, and respectful towards everyone. He was watching the pastimes of his little brother Nimai. And actually in all of Navadvip, he was the only person who understood that, this is Krishna of Gokul. He enjoyed watching his naughty pastimes and all of his different activities with such love. But to not disturb the Lord’s purpose, he would not reveal it to anyone. Meanwhile, he was such a deep devotee. He loved to associate with other devotees. From all the great scriptures of bhakti we read, this is one of the primary characteristics of a true devotee – to take the greatest pleasure in the association of other devotees; do not take for granted. Sometimes, devotees would find faults with other devotees to Srila Prabhupada and Srila Prabhupada would say, “If a person is dirty but they are in the shower, we shouldn’t criticize him for being dirty, we should appreciate that they are in the shower. Because, it’s just a matter of time, if they just stay in there that they will be clean. But if we criticize too much, they may leave the shower. So, somehow or other appreciate.” Gurudas prabhu so poetically explained yesterday, that we were ‘work in progresses!’ Srila Prabhupada, Nityananda, Lord Chaitanya, would bring people from all different backgrounds, and by giving them the holy name, and the principles of bhakti; giving everybody a chance to become completely purified. To be a fallen soul and attract grace is a much more hopeful situation, infinitely more hopeful than being extremely pious, extremely religious and being so proud of what we are, that we don’t attract that grace. “Lord Chaitanya, you are patita-pävana. You are the friend of the most fallen, and if you search the whole world, you will find no one is more fallen than me. So my claim should be first.” And this was the same mood as Rupa Goswami and Sanatana Goswami. Sri Chaitanya Mahaprabhu told us that they are the acharyas, the sambandha guru and the abhideya guru – the gurus that are teaching us how to establish our relationship with Krishna and how to actually realize the perfection. They wrote books that revealed those truths to us. But as acaryas, they taught by their examples. Lord Chaitanya picked them up because they wouldn’t even get up from the ground; he picked them up. He would tell Santana Goswami, “Your humility is breaking my heart,” and embraced him. So it is this quality that opens our hearts to receive grace. And it is that grace that ultimately is the only means of understanding Krishna. Vishwarup just loved to be with those who loved Krishna. He was the embodiment of a perfect Vaishnava. Even though he was very young, he was only a teenager, and Advaitacharya was a very elderly man, as was Thakur Haridas, Srivasa, but they loved him. He would speak from the scriptures and when he would speak, he had scholarship, but beyond that he has such respect, such sweetness, such realization and such devotion that when he would tell a story or recite a verse, it would conquer people’s mind and melt devotees’ hearts. They could not give up his association, and he could not give up their association. Practically, the whole day Vishvarup saw that the people of Navadvip, the general population were so offensive, so materialistic, so scholarly, but extremely arrogant about their scholarship. But Vishwarup would see people, there every professor in Navadvip had 1000s of students, and there were 1000s and 1000s of professors. And not only every professor, but every student was constantly trying to prove to other that I know better than you; it was a common thing. Vrindavan Das Thakur explains that at the bathing ghats at noon, everybody would gather together and all the different students would always end up fighting with each other. One would call out, “My teacher is the best and all others are useless. The proof that my teacher is the best is that I’m his student. And therefore all other teachers must be useless because I’m not their student.” Now when you have 100 and 1000s of people all saying that, there is not much unity. And others would say, “Your professor is just a dumb fool.” And this was going on, and they would be splashing each other, and throwing sand on each other, and fighting with each other, and swimming away from each other, and swimming at each other. And when some lady is coming to get some water from the Ganga to bring home to cook with, there is everybody splashing and throwing sand, and they would take mud from the Ganga and throw at each other; and it was very serious. It was play, but it was serious play. So, Vishwarup was seeing this. In the name of studying scriptures, it was increasing their materialistic arrogance, greed, material attachment; he felt such pity for them. But he felt that there was nothing that he could do for them. So it would simply break his heart to see it. And it was all around him. And at the same time, most of these people had nothing, but terrible things to say about devotees. Because devotees were humble, devotees were not materialistic, devotees were talking about a supreme God whom we should serve. This is contrary to their whole conception. So, Vishvarupa would get up really early in the morning, before practically anyone would be awake, and then he would go to bathe in the Ganga. Then he would go to Advaitacharya’s house and stay there all day, where they just talked about Krishna, chanted about Krishna, and he helped Advaita in his seva to the deity of Krishna. They were together. It was the spiritual world. He wouldn’t go anywhere else. The devotees couldn’t understand why they were so attracted to this little Nimai; with unblinking eyes they were looking at him. They couldn’t talk about Krishna. They couldn’t even chant Krishna’s names. All they could do is look at this little boy; he mesmerized them. He totally captured their entire consciousness. They couldn’t even move, they just stood like statues looking at him as Nimai was smiling, and he pulled his brother’s clothes and they ran off with him. The devotees looked at each other. Who is that boy? How does he do this to us? Vishwarup would have prasad and as soon as prasad was done, he went to Advaita’s house, and spend the rest of the day there. His mother and father, Sachi-Jagannath were thinking, ‘He is so absorbed in all these scriptures that he has no attachment to the material world whatsoever. So we should get him married just to make sure he stays home.’ So they were actually arranging a marriage for him. And Vishvarup understood that. In the middle of the night, without saying anything to anyone, he quietly left home forever. Sachi mata, Jagannath Mishra, “Where is he?” The next thing they know is that they get the news that he has taken Sanyasa, the renounced order of life, and was given the name Shankararanya. He travelled from place to place, different holy places and ultimately came to Pandharpur in Maharashtra. Because they loved him so dearly, it was so painful when he was gone, at such a young age. Their hearts were broken. Vishwarup was Balaram, he is the expansion of Nityananda and Balaram; he attracted their love in that way. It is described how Jagannath Mishra and Sacidevi were so much grief-stricken, and Nimai was also grief-stricken because that was his elder brother and his dearest friend, that was the one person, he really looked upto in Navadvip. He was crying, “My Vishwarup, my brother, you have left me!” And Sachi Mata and Jagannath Mishra were beside themselves. Relatives were coming and trying to pacify them, they said, “Actually you are so fortunate,” even though they were crying. The relatives were crying in separation, unbearable, that he has left us. But they were saying, “You are so fortunate that you have such a son like this. According to the scriptures if someone in the family becomes a sannyasi, 60 million relatives are elevated to Vaikuntha. You are so fortunate, because of your son everyone would be delivered, your forefathers, your future generations, everyone.” But for the mother and father whose hearts are broken all this philosophy doesn’t make so much effect. They just wanted Vishvarup. They didn’t care so much about this Vaikuntha. But Jagannath Mishra would become very philosophical and that would pacify him. Then, he would think of the qualities of Vishvarup and break down crying again. But ultimately he came to the conclusion that Krishna gave me this beautiful son and Krishna has taken this son away. Whatever Krishna does is perfect, let me just worship Krishna. Meanwhile all the devotees, can you imagine, day and night, could not be away from Vishvarup. They loved him so much because he loved Krishna so much, and his love for Krishna was so contagious, it was so inspiring that it would put them in such ecstasy of yoga or connection with Krishna. But now he was gone. So in their sorrow, they were crying out Krishna’s names, and just as they were crying out Krishna’s names, little Nimai, covered with dust and hair all scattered, playing with his friends, ran really fast right into the door of Advaita’s temple and just smiled; stood there and smiled. And with this beautiful smile on his face, his teeth like rows of pearls, he said, “Because you called me,” and then he ran away. They couldn’t speak for a while. That beautiful image of little Nimai was enshrined deeply in the core of their hearts and they were asking, “Who is he?” But by the Lord’s own arrangement they could not understand that he was their own worshipable Krishna. Jagannath Mishra said, “Everything is happening by Krishna’s grace, not by material arrangements. If Krishna wants him to have a good wife then he will have. And Krishna loves him, there is no doubt, he will get. And as far as money,” he said, “My wife, please wake up to the reality of this world. I am a learned scholar. I know all the scriptures and yet we hardly ever have enough food for one day, and look over there, over there and over there, there are people who cannot even write one letter of the alphabet and they have big beautiful homes. And there are hundreds and hundreds of scholars and pundits standing in a line to get donations from them.” Then he called Nimai and said, “Nimai from this day, you are forbidden to study any book. You can do anything else you want, but not study. I will be totally lenient on you on everything, but study.” So Nimai was obedient about that. And he did whatever he wanted. Nimai had friends and they really played in the day. Shall I give some examples given in the Chaitanya Bhagavata? He would go during the day with his friends and look around at things that they could attack at night. At night two friends, covered with a thick white blanket would looked like a bull. They would go into these gardens and start knocking down all the banana trees. And when the people in the house would hear (Maharaj makes sound of trees being knocked down), they would come out and see this giant bull knocking down the banana trees and they didn’t know what to do. When the children were out of sight, they took off the blanket and ran away and laughed to see the mischief they did. Sometimes, if somebody was not nice to them in the day they would get them in the night. One of the ways they would get them is that they would tie their doors and windows from outside and lock them inside. Now whether you are Brahman, Vaishya, Kshatriya or Sudra, whether you are red, white, black, yellow or brown in color, whether you are male or female, whether you Hindu or Muslim or Christian or Jew or Jain or Sikh or Parsi or agnostic or atheist or literate or illiterate or rich or poor, we all have certain things in common. And one of those things is when nature calls you must respond. So, these people at night had to use the washroom. But, in those days they didn’t have the toilets in their houses, they would always be outside the house, that was the Brahminical and clean thing to do, which Navadvip was very strict about. So when nature called they went to the door to go outside (Maharaj is making sound of them banging on the door) and the door wouldn’t open, they couldn’t get out to untie it. Nature was calling, soon nature was crying, soon nature was screaming, and they were beating on the door from the inside, “Let us out, let us out!” And soon nature was howling, and it was not brahminical to do it inside the house. And Nimai and his friends would be outside laughing and laughing and jumping and clapping. They would run away, without even untying the door. One day, Jagannath Mishra went some distance for some work and Nimai climbed up on some clay pots that were used for cooking. In those days they used wood and cow dung, and the clay pots would have very very thick black soot on the outside of it, they would just use it once and put it in a pile. So he climbed up and it is explained how beautiful he looked because he was covered with spots of this black smoke soot. It is said that his golden complexion was like a golden champak flower and the black spots were like black bees hovering around him. So Jagannath Mishra said to his little son, “You can choose any teacher in all of Navadvip and I will arrange you to study with him.” At this time he was about 8 years old. Jagannath Mishra gave him the sacred thread and the Gayatri Mantra. Nimai wanted to study under Gangadas Pandit, who is a great great devotee, who is in the line of Sarvabhaum Bhattacharya. Sarvabhaum Bhattacharya by this time was the greatest scholars in the world. At that time Navadvip was under Mogul rule, the Nawab Hussain Shah was living in the Malda district in the Ramkeli area and he had Governors called Kazis, who were not only religious heads, but they ruled over military, the police, they taxed, and they made laws for the area. It was very suppressive in Navadvip. Nearby in Orissa, Maharaja Prataprudra was a great devotee of Lord Jagannath and he invited Sarvabhaum Bhattacharya to be the high scholar, the Guru of his kingdom. So, King Prataprudra made all arrangements and Sarvabhaum Bhattacharya came to Puri and made his headquarters. But, he kept some of his students in Navadvip like Raghunath, Raghunandan. He had many different students Krishnanada, Gangadas and they were such powerful teachers and had written such incredible books, even to this day. In Bengal, some of the highest authority books on grammar and so forth were written by the disciples of Sarvabhaum Bhattacharya. So when he went to Puri, and the credibility of his school did not in any way be diminish, because his students carried it on. So little Nimai was brought by his father to Gangadas Pandit. And Gangadas Pandit was so happy to see such irresistibly loving child. Any lesson Nimai learnt upon hearing once he mastered it. And even though Gangadas Pandit has students in the same classes that were 10, 15, 20, 30 years older than Nimai, he quickly made Nimai as his prime student. Nimai was in the mood of Navadvip, but he excelled everybody. And they would say, they would present something from the scriptures, Nimai would completely totally comprehensively defeat everything they said. They were speechless. They said, “You defeated whatever we said is undefeatable.” Nobody could say anything against it. And then he would say, “Oh, watch this,” and then he would say – I’m saying it in few seconds – he was going through eloquent, poetic, incredible conclusive debate against his own arguments. And he would reestablish the original precedent. And after that all of them said, “Nimai we want to be your students.” And this way so many people were coming to become Nimai’s students. He was just incredible. And his mother was so proud of him. People of Navadvip were praising him. He was the crest jewel of all the scholars of Navadvip. In fact, one well-wisher named Mukunda Sanjaya, who was wealthy man, opened up his gigantic courtyard for Nimai to start his school. And Ganagadas Pandit profusely blessed little Nimai, “Yes! Because Nimai was always so totally respectful and submissive to his teacher. Yes! On my behalf start your own school. Thousands of students came. Meanwhile Jagannath Mishra, one morning, in the room where Saci Devi was sleeping, wakes up crying out, “O Krishna, O Krishna, please keep Nimai home please!” And he gets on the floor and starts offering his obeisances and praying. Sachi mata said, “Don’t take your dream so seriously, it was nothing but a dream. We both see our Nimai is happy studying and teaching. He is not going to leave us.” In this way they talked together and she tried to pacify him. But after this dream Jagannath Mishra was never the same. Eight daughters had died, their eldest son left home forever. All they had was Nimai. One day Jagannath Mishra had a high fever. It was apparent that he would not survive. Sachi mata was beside herself. Nimai told his mother that, “The soul is eternal, and it is only the body dies. Let us help our father to attain the ultimate destination.” So he gathered the relatives together and they surrounded Jagannath Mishra’s dying form, and they all loudly chanted around his beds the names of Krishna. They put tulsi leaves on his body and on his neck. They sprinkled his body with the water of the Ganga. Together they all chanted, and then they picked up his body. He was still alive. They brought him right to the bank of river Ganges and Nimai, with deep emotions, clasped to his heart the feet of his father and wept. He said, “My dear father, if you leave me, who will I call my father, who will teach me, who will correct me, who will hold my hand, who will embrace me. Will you leave me?” In this way his whole body was shaking and tears were pouring from his eyes. Seeing this Jagannath Mishra very softly spoke. He said, “I’ll reveal my heart. I cannot speak much, I don’t have capacity. O Raghunath (Raghunath was the name of their deities at home, O Lord Krishna, You are taking me away, I entrust you with the care of my son and my wife. Please protect them, please bless them with your grace.” And after speaking that, surrounded by the chanting of the holy name, Jagannath Mishra chanted Krishna’s name and his soul departed. Sachi Mata was right there, she fell to her knees, “I have been with you all these years, when you were eating, when you were sleeping, when you were walking, when you were facing problem, when you were joys, we have been together always. Why is it that I can’t come with you? Why have you left me? All have I left now is Nimai. He has no father.” She prayed to Krishna for Nimai. Sachi mata knew nothing but her son. She had lost her 8 daughters, she had lost her son, now she lost her husband. Her life, her soul and everything was her selfless service to her Nimai. Nimai understood, ‘I have to console and give strength to my mother.’ And by his the power of his beauty and affection that whenever Sachi mata looked upon Nimai that was no possibility of even a trace of sorrow in her heart. But it is explained, if Nimai was not before her by his presence for even a few minutes, Sachi mata would go blind, she couldn’t see anything. This was the intensity of her motherly affection. I was planning to speak and end on more happy positive. Of course everything is positive. I’m scheduled to speak Damodar ashtakam.